Why is social innovation more relevant today than eight years ago? 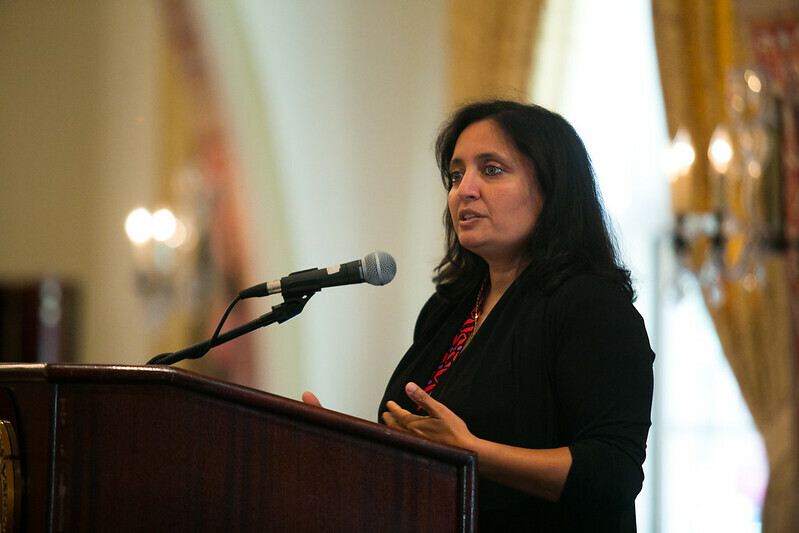 Sonal Shah, executive director of the Beeck Center at Georgetown and founder of the White House Office of Social Innovation and Civic Participation, gave many compelling reasons during an Oct. 5 social innovation research talk, hosted by the Sol Price Center for Social Innovation at the USC Price School of Public Policy. The event drew an engaged audience of nearly 100 students, alumni and faculty from across the USC campus, along with local practitioners working in social impact fields. Shah began her remarks by sharing lessons learned from one of her most recent achievements: founding the White House Office of Social Innovation and Civic Participation. After joining President Obama’s transition team in 2008, Shah and her colleagues proposed the new office to harness the community energy that was already percolating around social innovation. Her team established a $50 million Social Innovation Fund and hosted 24 events with the President and First Lady in a single year. While reflecting on some of the challenges, she highlighted the lack of data and research about social innovation. Shah also emphasized how some, but not all, business principles can translate to social innovation. Unlike most entrepreneurs, social innovators aren’t trying to sell a product. However, it’s still important for social innovators to be clear about their desired outcome — whether it be poverty reduction or higher educational attainment. She underscored the fact that achieving these outcomes requires working across traditional silos. Solving complex problems means combining the efforts of both the public and private sectors, and reaching across the boundaries that divide policy areas as diverse as transportation, education and health. She mentioned an example: in New Zealand, the public sector is paying the private sector to own and operate prisons, with the goal of reducing recidivism — in contrast to the more typical goal of minimizing cost per prisoner. Shah’s unique perspective on social innovation was shaped by her distinguished and varied career working in government, tech and international development. Her experience includes setting up the central bank in Bosnia, working on post conflict reconstruction in Kosovo, spearheading civic engagement and impact investing initiatives at Google, as well as clean technologies strategies at Goldman Sachs. Shah fielded several thoughtful questions from the audience, many of which probed how social innovation differs at the local, state and federal levels. Shah described the role of the federal government as deciding how money is spent, and convening different groups to share ideas and inspiration. She called the city and district level “much more real,” citing how mayors and other public officials must tackle immediate issues of housing, education, transportation and food on a daily basis. Shah concluded the conversation with a series of inspiring examples of social innovation around the world. Examples include: transportation policy in Bogotá, Colombia, mobile money in Tanzania and Kenya, and a biometric ID system called Aadhaar in India. She noted that whether these experiments succeed or fail, they all represent highly creative approaches to addressing issues in socially innovative ways.